If like me, you find yourself juggling multiple messenger applications to keep your friends, family and colleagues happy you will be glad to hear about Pidgin. 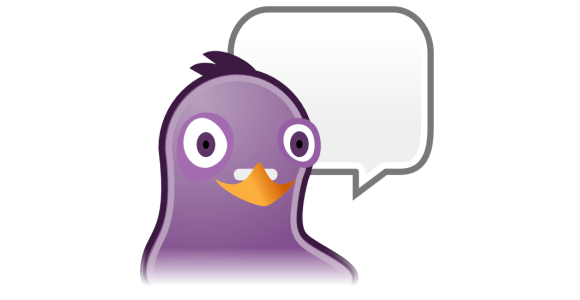 Formally known as Gaim, Pidgin is an open-source messaging program that allows the simultaneous use of multiple instant messenger services through one application. Available as a free of charge download from www.pidgin.im, this small program supports 17 networks including favourites AOL, MSN and Yahoo as well some lesser known ones such as Jabber and Gadu-Gadu. Additional chat clients such as Skype and the Facebook Chat tool can be added through the use of freely available third party plugins which are easily located on the Pidgin site. Once installed, simply select the type of account you want to add (for example a Google Talk account) along with your user name and password. Any of your contacts from that account that are currently online will automatically appear in the buddies list and you can begin chatting straight away. Not only does this offer the distinct advantage that you don’t need to switch between several applications if you have contact with friends on multiple networks but it also cuts down on the resource requirements of having multiple chat services running on one machine. Along with being cross compatible with different networks, the Pidgin application is also available for many different Operating Systems; as well as the obvious Windows version, the developers have provided support for Solaris, SkyOS, Qtopia, UNIX, Linux and even the AmigaOS. All the standard features you would come to expect such as contact organiser, custom smileys, file transfers and group chats are present. The only slight criticism that I would have is that it doesn’t support video and voice chat however my assumption is that these protocols are difficult to integrate in to an application that has been designed to be compatible with dozens of networks and half a dozen different Operating Systems. Hopefully this lack of functionality will be addressed in future releases. Pidgin is completely customisable; the preferences dialog box provides an area where you can define every conceivable option including the interface, sounds, network connection, chat logging and your default availability status. In terms of appearance you can also change the font type, size and colour, formatting along with installing new themes which change the appearance of smileys and status icons. An additional option to install themes in order to change the actual user interface would be welcome as the default interface may be a little dull and unintuitive for some users.